Commercial Window Cleaning in Exeter and Devon. 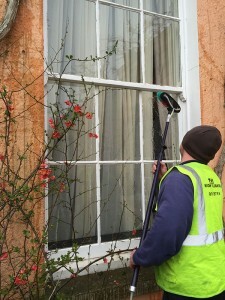 Commercial Window Cleaning – Serving the Exeter and Devon area. Sparkling clean windows give customers a great first impression of your business and here at CCS we understand the importance of providing an efficient, cost effective, window cleaning solution for your company. Whatever the premises, we have the cleaning expertise to keep your windows clean and ensure your clients and visitors see your building at its best. Our window cleaning teams can work safely alongside your staff and visitors, or we can arrange to visit your premises outside of working hours if necessary. Either way we will always ensure minimum disruption to your business on a date to suit your schedule. We’re trusted: Our loyal and dedicated staff are trusted by our valued commercial customers who allow us access into their businesses every day. Family run business: Now in our second generation, for the last 25 years we’ve been working with clients across Devon & Somerset, many of whom are still loyal and happy customers. We can clean all types of windows on any premises. Everything from glazing on industrial units to 18th century manor house windows and everything in between. Our client list includes NHS properties, school buildings, churches, housing associations, retail units, offices, public sector buildings and of course residential properties. We love a challenge and can overcome almost all access issues to get your windows clean. Single glazing, double glazing, secondary glazing, leaded windows and delicate stained glass windows – We have the expertise and equipment to clean all types of glass, whatever your window cleaning needs. We’re always happy to offer advice on a window cleaning schedule to suit you and your diary or your business needs. The frequency of the clean may depend on personal preference or the area your windows are in. A shop window on a busy road may need daily or weekly cleaning, while offices and car showrooms may only need a monthly clean. This means we offer daily, weekly, fortnightly, monthly, bimonthly or quarterly cleans as standard or we can tailor a specific cleaning plan to suit you. Who will clean my premises windows? Got a question? Please check our commercial window cleaning FAQs.